Welcome to the Monrovia Public Library. Our library is nestled between the Monrovia Community Center and Phillips Ball Park, making it easily accessible to families in the Monrovia and Harvest communities. We are your friendly neighborhood library, offering services and programs for families and patrons of all ages. Our goal is to make your library experience personal and enjoyable! Read more about the Monrovia Friends of the Library. Take Research Park Blvd North to the stoplight for Hwy. 53. Turn left onto Hwy. 53. Turn left at first light onto Kelly Spring Rd. Follow Kelly Spring Rd. for approximately a mile, until it dead-ends at a stop sign at Jeff Road. Turn left onto Jeff Road, then immediately turn right onto Allen Drake Drive, just after Phillips Park (but before Nick Davis Road). 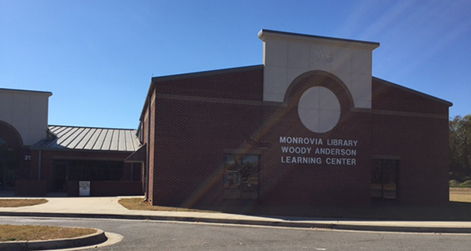 Library is located in the Monrovia Community Center.